A very simple curry that can be made from your Sunday roast leftovers, the pork can be changed for any meat you like. Tasty pork tenderloin with a fantastic mix of spices. Cumin flavored roast pork loin with a mixed fruit filling. A Vietnamese meatball used to make Banh Mi. Stewed pork tenderloin with buckwheat, onion and carrots. A tasty way to have eggs and sausage ready to go in the morning. You can turn these carnitas into wraps, by rolling them in corn tortillas with chopped tomatoes and shredded lettuce. Traditional Tex-Mex picadillo with ground pork. Quinoa chili verde is hearty and satisfying with lots of smoky flavor. This dish is a free form lasagna without the hassle of having to mess with lasagna noodles. You can use pretty much any kind of pasta. 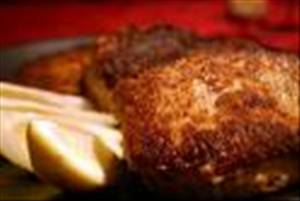 A healthier shake 'n bake pork chops. A tasty way to change up pork chops. A light version of yummy classic. Fast and delicious pork chops.